The partners in this FIRM-funded project are University College Cork (Prof PLH McSweeney, coordinator), Teagasc, Moorepark (Dr KN Kilcawley), University of Limerick (Dr MG Wilkinson), and Dairygold Cooperative Society Limited. To assess the effects of various pre-treatments of cheesemilk on the ripening of cheese made therefrom. 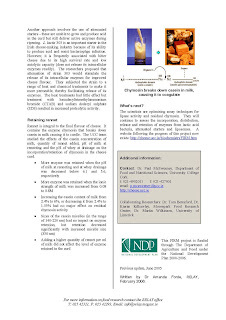 To study the incorporation, distribution and release of ripening enzymes in cheese curd and factors that affect the dispersal of enzymes through cheese curd. 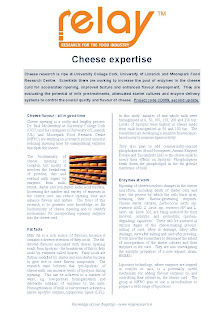 To assess the potential of liposomes for the acceleration of cheese ripening. 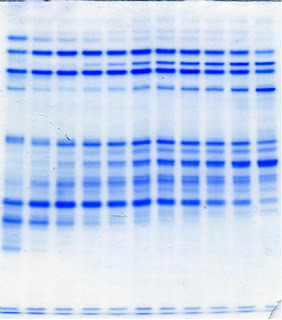 To identify LAB or yeasts suitable for use as adjuncts to improve cheese quality. 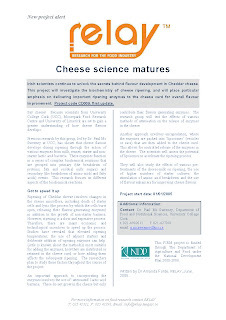 To study novel methods for accelerating cheese ripening and improving cheese flavour including increasing levels of all important ripening enzymes concomitantly, enhancing amino acid catabolism in cheese during ripening and by the use of flavour enhancers. This project commenced on January 1, 2005 and progress reports and information fact sheets (below) are published regularly by RELAY.